Prepare for the war as you build units against the computer. This is going to get insane! In this game, there are 6 castles. The main objective of this game is to destroy one enemy castle and protect all of your castle. The castles have 20000 life and this cannot be increased or repaired. The main objective of this game is to destroy the ENEMY CASTLE and protect YOUR CASTLE. The castles have 20,000 live and this cannot be increased or repaired. To attack the enemy castle, you must train SOLDIERS. To do so, click which soldier to train. After clicking the button, your soldiers will appear and will attack your enemies and destroy the enemy castle. You can also build a TOWER DEFENSE by clicking the tower and placing it in the red area. There is no buyback system in this game, but you can buy different towers and replace your current towers. You can only train a maximum of 50 soldiers in battle at a time. There are 45 different soldier types and 15 different towers in this game. Use SPECIAL WEAPON to attack the enemy. Be careful though, your enemy will also have a special weapon. Every special weapon can only be use one time. But with every new soldier you can use a new special weapon. attack your castle. 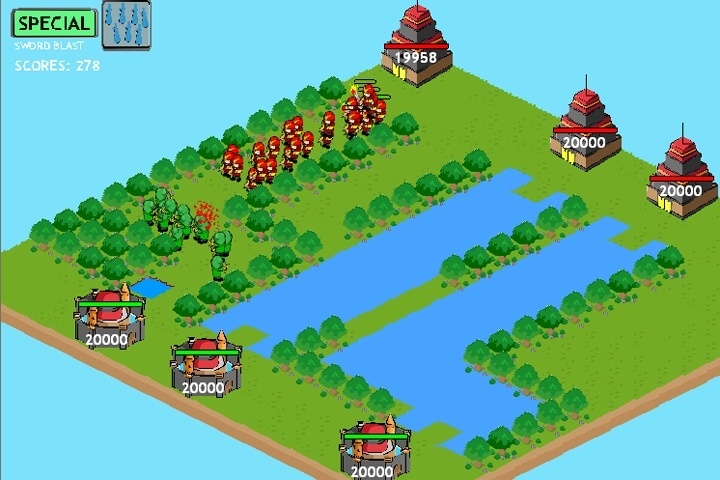 Build tower defenses and attack the enemy from land, sea and air! If you want to play Strategy Defense 4 games online you have come to the right place! GamesLoon adds new Strategy Defense 4 games every week. This is your game portal where you can find the biggest collection of free Strategy Defense 4 games online. Do not forget to rate our Strategy Defense 4 free online games while playing!